This page provides links to the Geographic Information Systems (GIS) for the results of each REC. A Geographic Information System (GIS) takes data with a known geopgraphic position and places it on a map. It allows the user to view, analyse and interpret data to reveal relationships and patterns. Geographically-referenced information from different sources can be added to one GIS to gain a greater understanding about an area. The RECs produced four WebGIS to make the data available for people to use. 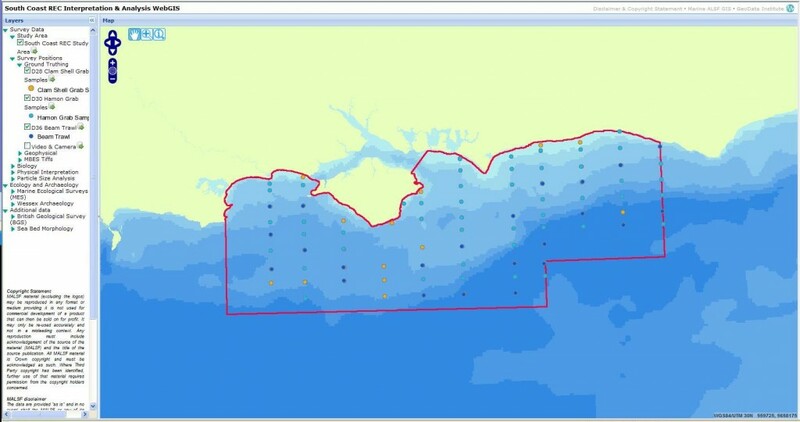 GIS allows us to map the location of different geological features, such as sandbanks, where you will find a shipwreck, or the habitats of different sea animals. This weblink allows you to browse and visualise a number of geospatial datasets submitted as part of the Marine ALSF East Coast REC Project. This weblink allows you to browse and visualise a number of geospatial datasets submitted as part of the Marine ALSF South Coast REC Project. This weblink allows you to browse and visualise a number of geospatial datasets submitted as part of the Marine ALSF Outer Thames Estuary REC Project. This weblink allows you to browse and visualise a number of geospatial datasets submitted as part of the Marine ALSF Humber REC Project.